Is It Nerves of Bad Thinking? Do you remember this game? It is call Buzz Wire Game or Wire Loop Game. The object was to pass the metal ring through the wire maze without touching the wire. If you touched the wire a buzz or light would go off telling you that you failed. It seemed like a simple skill, but it proved to be very hard to do. The harder you tried and the more concentration you put into completing the task the earlier you touched the wire and lost. So then you think, the next time I’ll go even slower as not to make a mistake AND ------ the results were even worse! Does this scenario sound like your golf swing or a certain facet of your game? Is it poor nerves or do you need to change your thinking approach? 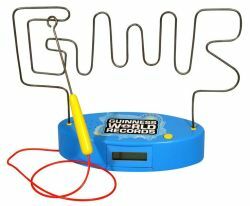 In the Buzz Wire Game there are experts who can maneuver the metal hoop through the maze in a few seconds, while equally dexterous individuals cannot complete one circuit before setting off the light or buzzer. The expert “FLOWS” through the wire course with seemingly little care or thought of what he or she is doing. They make it look easy. Much like a professional golfer does when driving the ball straight down the middle over 300 yards. If you became proficient at the wire game, you learned to not try to be perfect and overthink your actions. You let your metal hoop “FLOW” through the maze and you suddenly where farther along then you ever were and then you started to think and the “FLOW” stopped and you hit the wire. Gradually you kept the “FLOW” going through the entire maze. Concentration was sharp, but fear of failure was diminished. As a kid or young adult you might have thought your nerves weren’t up to the task to complete the Wire Loop Game. But it wasn’t your nerves. You were asking your mind and body a near impossible task of controlling every small intricate muscle movement perfectly. Dave Stockton, the two-time PGA Champion, gives his students a test before he starts his putting lessons. He asks them to sign their name on a piece of paper. He then asks them to repeat that signature exactly like the one before. No one could make an exact duplicate. Suddenly they were “TRYING” and “CONTROLLING” their actions and the results weren’t even close. Trying to be perfect in golf is a losing proposition. Over-thinking and trying too hard to control your muscle actions leads to indecision and failure. Golf is a dynamic game that requires a free mind and loose flowing muscles. Change your mindset and allow yourself to “FLOW” and your nerves will go away.